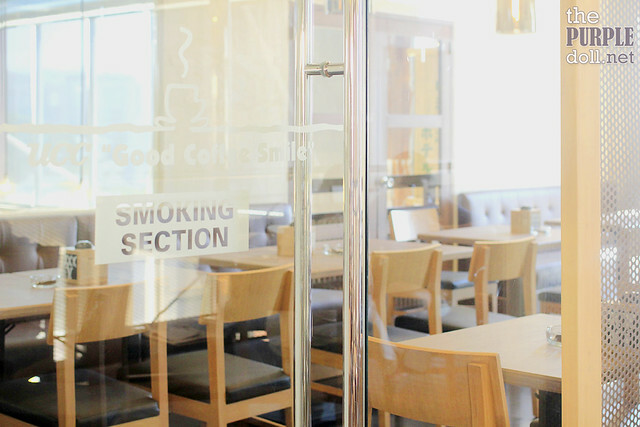 UCC in the metro has been satisfying us with not just coffee, but also with their food -- be it the Vienna Cafe, Park Cafe, or Cafe Terrace concept. However, the newest addition to their family of cafes is probably my most favorite among them all. UCC Clockwork at Blue Bay Walk. Unlike the other UCC stores, UCC Clockwork adopts the "third wave coffee" concept -- a global movement that aims to produce higher quality coffee, mostly single-origin, and put back the artistry in coffee-making. So yup, don't expect ice-blended frappe drinks here. UCC Clockwork ain't called clockwork for nothing! 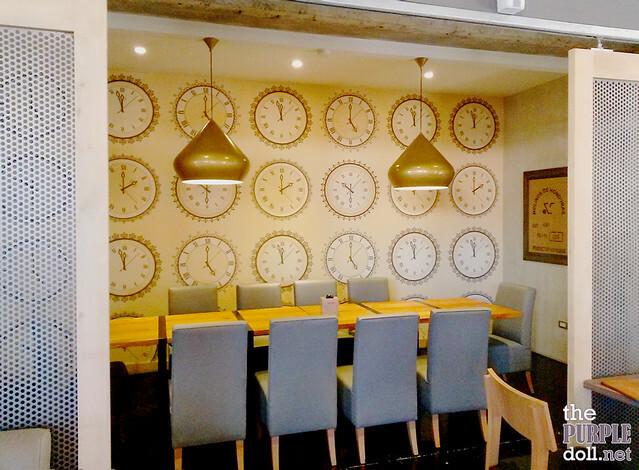 This is just one of the private rooms at UCC Clockwork. They even have a spacious smoking area on the mezzanine level! There are quite a lot of spacious cafes in the metro. However, UCC Clockwork is probably the biggest I've seen in recent memory. There are a few tables on the ground floor, and a wide dining and lounging area on the mezzanine. They even have about three or four private rooms perfect for meetings. And the high ceilings, they make the place feel even more spacious! I actually wanted to take more photos of the spacious interior, but my phone battery already died. And it didn't help that I only have a 40mm lens on my dslr at the moment. (¬,¬”) (I only use my phone when taking photos of resto signages and interiors.) Been checking out ZALORA for power banks, since I'm in dire need of a heavy duty one. Which do you think should I get? Worried it'd be hard to call the attention of the staff? 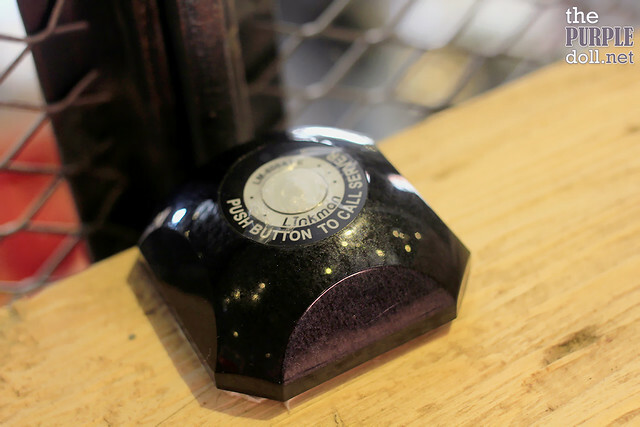 Push button callers are installed all over the cafe. When we got inside the cafe, I knew I wanted to sit at the counter tables lined on the edge of the mezzanine. 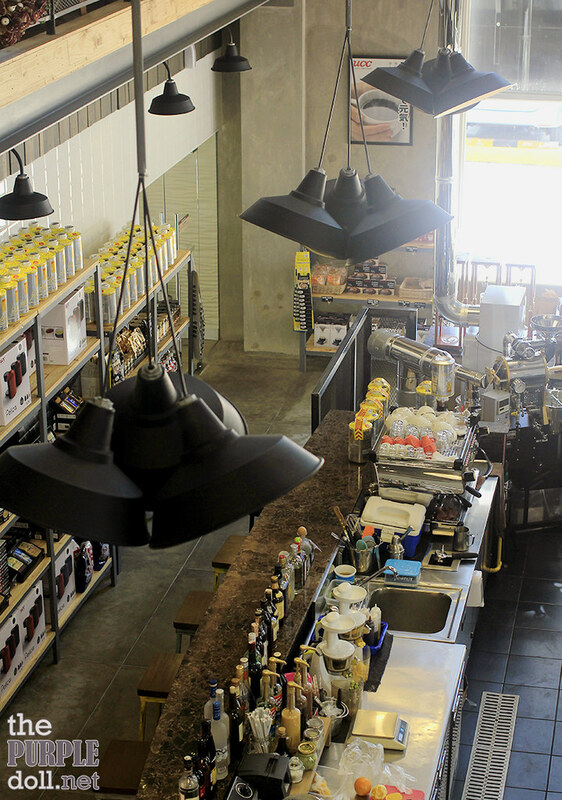 It was the perfect spot to appreciate the spaciousness of the place, and take in the industrial feel of UCC Clockwork, while getting a nice view of the bar area below. The boyf asked for their bestseller, and he was recommended the Brazil #2. And upon taking a sip, I couldn't agree more! This hand-drip coffee tasted great! It was pretty light, full-bodied yet far from acidic. It also had sweet, nutty notes and even hints of bittersweet chocolatey flavor. This is by far the most delicious-tasting coffee I've ever had. And please, if you love coffee, don't add sugar or cream to this serving. It's already perfect the way it is! As for my choice of drink, I had the matcha latte since I was craving for matcha so badly. This cup was nice and creamy, although I would've preferred if the matcha flavor was stronger. Thinking back to when we visited UCC Clockwork, I wish I'd ordered one of their single-origin coffee instead... Oh well, this just calls for another visit then! And hopefully, soon. Dominica Nuevo Mundo Typica (P240) -- orange & nuts with a hint of floral notes, I'm eyeing on you! The boyfriend loves his pastas, so when he saw this on the menu, he didn't even think twice about ordering it. Al dente-cooked linguine with white truffle oil, sausages, parmesan and mushrooms in bechamel sauce, served with garlic bread on the side -- this dish tasted as good as it looks and sounds. 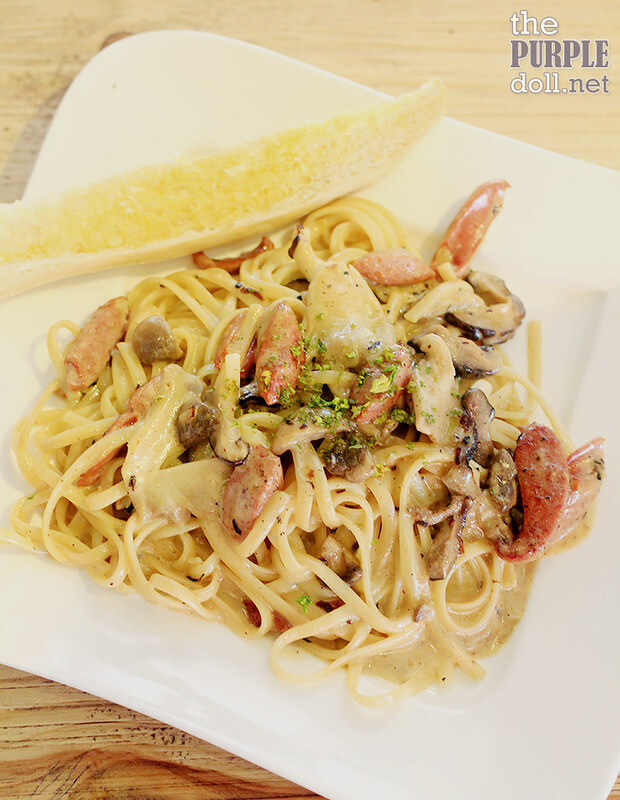 Every forkful gave off soft yet firm pasta goodness with just the right amount of creamy, mushroomy and truffle oil flavors. However, I thought the dish lacked a pinch of salt. After asking for some salt and pepper, the boyf seemed to dig it more. I would've settled for a light salad if I weren't too hungry. But since we were out for brunch at 12 noon (yup, haven't had breakfast yet), I was craving for something with rice. And rice I did have. Homemade corned beef with kimchi rice, poached egg, dijonnaise, and a side of salad -- you'd think a girl as small as me wouldn't be able to finish this plate. But I did! It was THAT good. The corned beef was quite thick and chunky, yet tender, savory and simply delish. And although I initially felt like there was not enough corned beef and too much kimchi rice, I can't complain 'cause I wolfed down the rice like nobody's business! Everything on this plate, or serving board rather, was great. If only there was another piece of corned beef. Teehee! UCC has been one of my favorite cafes, but I've honestly been tired of the same old items they have on their menu. So I'm so happy that there's UCC Clockwork to freshen things up and give the younger, hipper market, as well as the more serious coffee enthusiasts, a new place to hang out at. And although we've only tried one of their single-origin, pour-over coffees, we were so impressed that we'll definitely go back for more. Their food, as expected of UCC, is of good quality and taste too. And how can I not mention the industrial, steampunk vibe (that I love) oozing from the interiors? If only the servers would smile more and exude more warmth, then I won't be hesitant to say that UCC Clockwork is my most favorite cafe to date. I want to try Matcha Latte on my next visit. I wonder if they can serve it cold though? I've hanging out at UCC Café (I'm usually at UCC Forbestown) its ambiance is quite relaxing, unlike the busy Starbucks. Coffees are well-brewed too! You said you're so glad that my boyfriend shares the same sentiments so there will never be a problem going to the cafe. Haha! Don't worry, you'll still get lost in time when you visit. 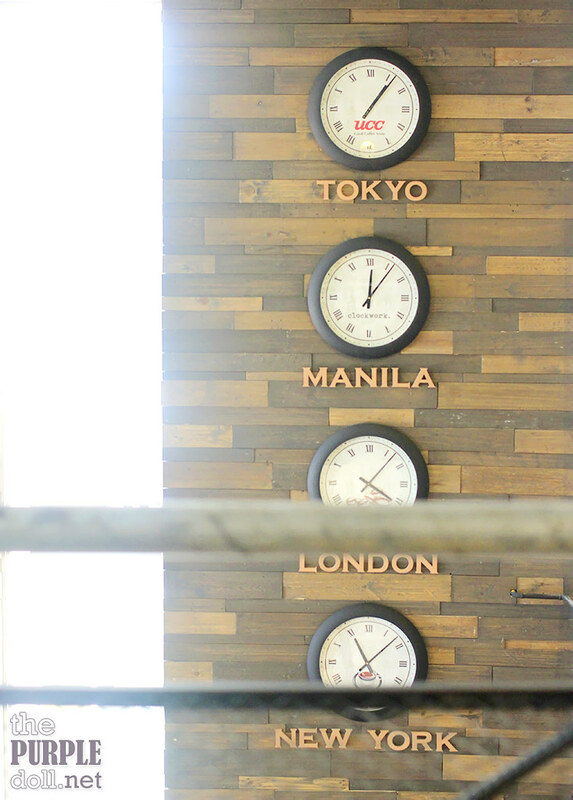 Although there are lots of clocks, they're more of a decoration. When we visited, we barely looked at the clocks for their function rather than for aesthetics. XD We were actually surprised to find out we've been in the place for hours already! Love UCC coffee, though I haven't visited this cafe before. The food looks great! 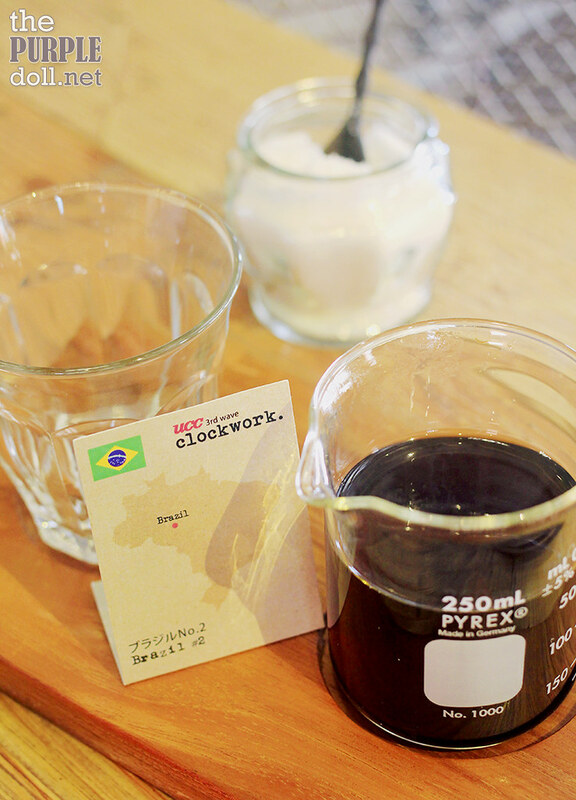 I like the concept of the clockwork cafe. It's a good place for blogshop photography! As for the food, I like green tea latte, but the bright green colour looks odd! 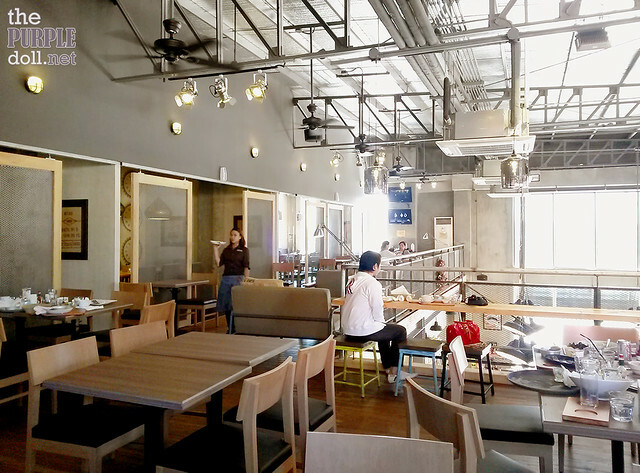 the outlook of the cafe looks really cozy and will be a good place to snap a lot of photos! but manila is not really on my to-visit list, but if i were to visit manila, i'll definitely look for this place! Agree with you, love your coffee don't add any sugar or milk in it. Taste the original. Their food look delicious too. The pictures of the food and drinks are fantastic. Thanks for sharing. I like the measuring cup, haha. We loved it too! :D It was a really nice quirky touch! 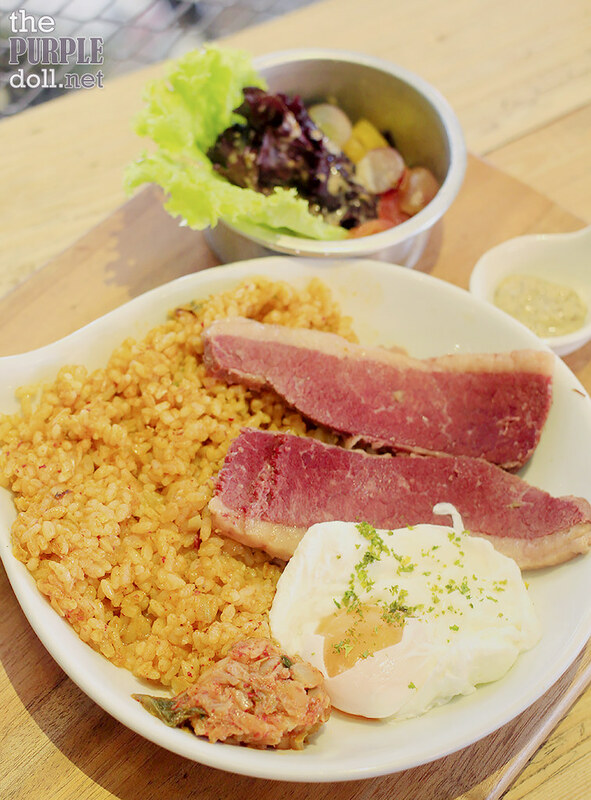 Corned beef with Kimchi rice looks good but expensive. Is that serving good for two? It can be shared by two, but I think it's more recommended to be consumed only by one. >.< Yeah, UCC cafes has been known to have offerings that are more on the expensive side. wow this place looks amazing, I simply adore the whole interior. Oh, their coffee is quite expensive compared the usual price I pay for coffee. I guess that bestseller is worth the price. I do love to hangout in coffee shops just to chitchat with friends. Their single-origin coffee is pretty pricey compared to most coffees since they're not just single-origin but also hand-poured. :) Artisan coffee, as most call it. What a cool idea. Everything clocks with some really delicious looking food thrown in. I love the artsy feel of the place. Cozy place Sumi and the foods sounds delicious. Yung fresh corned beef with sushi is some stuff I really love to try. Papaleng talaga! :D Kimchi po, hindi sushi. Hihi~ But yes, the place is really cozy and the food was pretty delish. 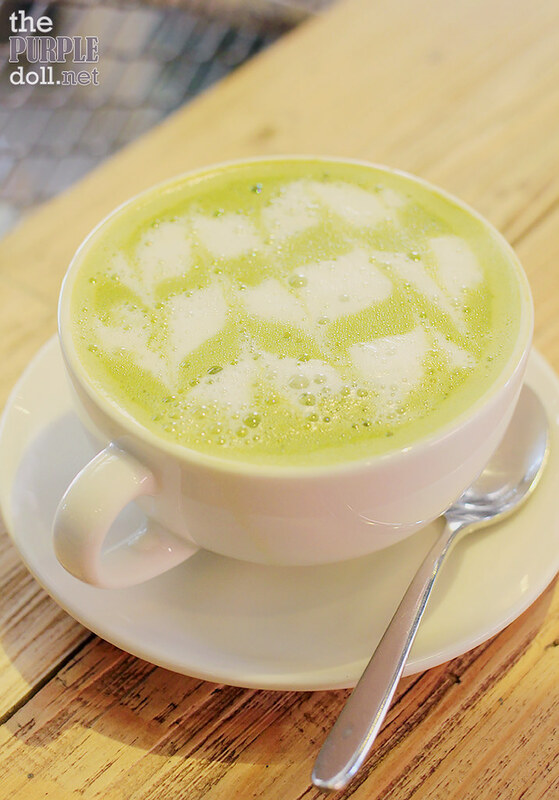 Hot Matcha Latte seems so delicious and beautiful! 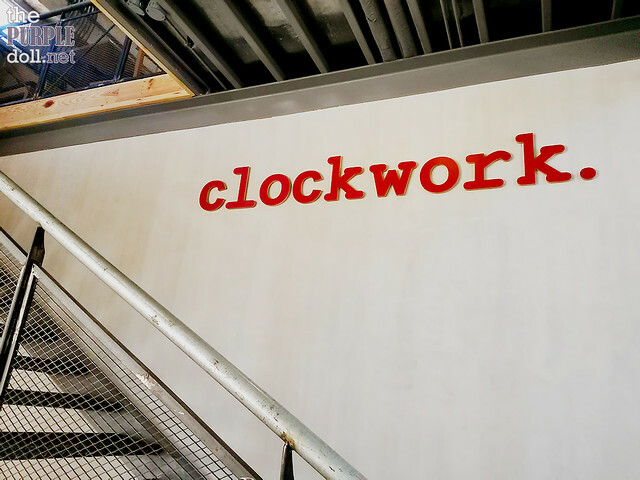 The Clockwork seems like a spectacular place to visit and hang out with friends, the menu offers tasty food and nice artistic ambiance. Beautiful place! Used to eat at UCC often because it was near my workplace then. I'm pretty sure the menu is updated and offers much more diverse coffee. Would love to check this location when I come and visit. Looking at the logo, I was wondering where I saw it then I realized... YES! It is in Blue Bay Walk. I've seen this before but didn't pay much attention. Who would have thought they had a great interior inside! I'll definitely be trying them anytime this month. The pasta did look like it lacks some taste. And looks too creamy? im a coffee lover and will definitely visit UCC branch in bluebay, besides its juast 30mins away from my house.